Property 39: Nice, centrally and very quiet apartment with parking! Our family of 7 people spent a week in the apartment of William. the house is located close to the center and the lift to the beach. When we arrived we found the very well prepared apartment, it was nice to find water and cola in the fridge. 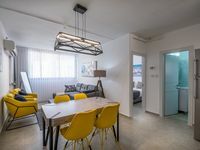 The apartment has absolutely everything necessary for life: domestic appliances, dishes, washing facilities, bed linen, towels in large quantities. the apartment is clean and proper, suitable for big family. The beds are comfortable. William is a great host, thank you very much! The building is nicely kept and quiet. It is just a short walk to the Kiera and Rechov Herzl. The apartment was lovely. Very clean. Nice bath. Fully equipped to live for a week or a year. 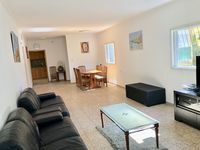 I&rsquo;ve stayed in Netanya before in an AirBnB and my experience with VBRO was so much better. I would definitely come back to stay at this property. Also Laura was warm, helpful and professional- a pleasure to work with. .